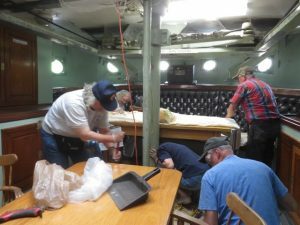 Workday: Historic Ships In Baltimore – May 5, 2018 – Chesapeake Chapter U.S.L.H.S. It was a warm overcast day with summer-like temperatures. 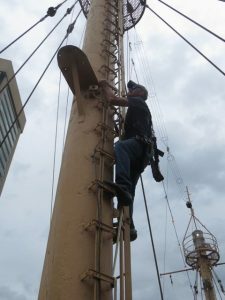 We had a crew of seven chapter volunteers who went to work on the lightship Chesapeake in Baltimore’s Inner Harbor. Our first task was to scrape a lot of the peeling paint form the ceilings in the forward exhibit area as well as the Ward room. Paint was raining down and then quickly cleaned up using the shop vacuums. The paint was peeling more noticeably than in the past because of the cold temperatures reached at points over the winter. After the scraping was done some primer was applied in one of the state rooms in the forward area. It was tight quarters and you had to have some level of agility in order to reach all the various nooks and crannies. There was also a little scraping topside where there was spots of peeling paint – again due primarily to the cold temperatures experience on the ship. 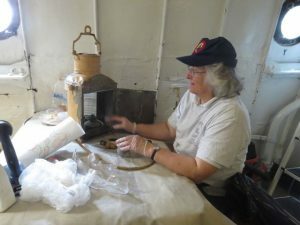 The interior of the range light removed from the forward mast was given a thorough cleaning on the inside and then we started removing the paint from the glass area on the outside. This was a slow process since we didn’t want to scratch the glass. 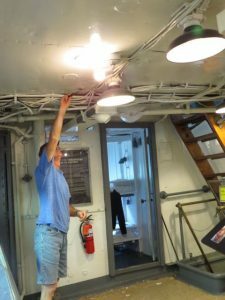 While the range light was being given a little TLC, Rob from the museum climbed the mast to inspect the light’s platform and put a cap on the electric outlet. He also removed the one remaining rusted bolt. The platform needs more work – but it will be better done using an extension latter to reach the platform and give it a good scraping and painting before returning the light to the mast. 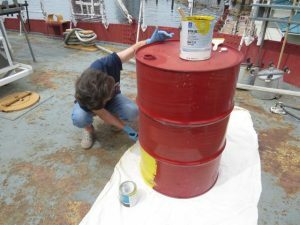 The gas drum was removed from its cradle and given a coat of bright yellow paint. This sure makes in stand out. Meanwhile below deck the forward port storeroom was emptied, scraped and cleaned so that it can be primed next time. They found an interesting assortment of items in the old storage area. Also below decks we gave one of the engines that is visible from the porthole a little cleaning so it will stand out a little better for visitors peering down in the engine room. There was various other electrical work done. Preparation for installing lighting in the exhibit stand we had given about three coats of paint to last year were started. 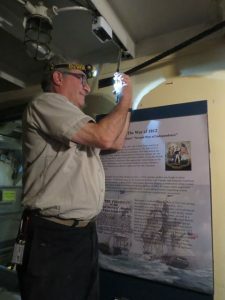 We removed an overhead light fixture from the starboard side exhibit area and we also photographed all the shroud grounding straps……. don’t ask me what that means – but we did it! The top of the binnacle on the fly bridge was removed and caulked because it appears to be leaking. 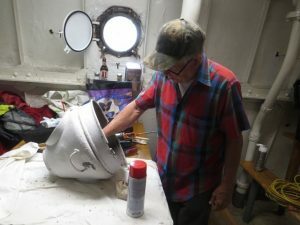 There were various other tasks not mentioned – it was a busy and productive day in the busy downtown harbor.